Dexter Daily: Michael C. Hall Talks Life After Dexter and More: "It's Exciting to Be Free to Explore New Characters"
Michael C. Hall Talks Life After Dexter and More: "It's Exciting to Be Free to Explore New Characters"
via Independent: There was a time when everyone wanted to do "a George Clooney" and make an effortless transition from the small screen to the big screen. The posse from Friends couldn't manage it. The Seinfeld squad struggled. And then came the new golden age of television and it seemed that every actor worth his salt wanted to make it big in our living rooms. So it's kind of a throwback to sit down with Michael C Hall and discuss Kill Your Darlings, his first film since TV executives murdered his serial killer Dexter. The 42-year-old gives the impression that he was dying for Dexter to end. On the final day of filming he says that a bar was set up and an impromptu party was had. He says, "I am certainly thankful for the time, and I shall miss that family, but there is also a sense of relief in that soup of feelings." A sentiment reinforced by his time on the Kill Your Darlings film set. "It was so nice to be reminded that there was something other than a serial killer to play. It was restorative." He has discovered the hard way how not to make proclamations about where his career will be headed. "You know I finished Six Feet Under and I said in interviews like this: 'I'll never do another television series again.' I learned to never say never, but I wouldn't like to make commitments to characters that are open-ended, right now." Read the full article after the jump! On television, Hall has specialised in playing characters carrying secrets around with them. As David Fisher in Six Feet Under he struggled to keep his family funeral home in business and during the course of the show managed to reconcile his homosexuality with his religious beliefs. As the eponymous lead in Dexter he was a forensic blood-splatter analyst who moonlighted as a vigilante serial killer in his downtime. So for his foray into the silver screen he was looking to change things up, although the plan didn't quite come together. "I think the role is different [to things I have done before]," he says. "It's a different time period and a very different story. I don't know if I was super self-conscious about avoiding any parallels between what I've done before and this; then I would not have done it. After all, it's a homosexual scene and a murder scene, a sort of mash-up of my TV roles." That's quite a good way of putting it because in Kill Your Darlings Hall is both victim and aggressor. He plays David Kammerer, who in 1944 was fatally stabbed by Lucien Carr, a literary student at Columbia University. Carr was the crush of a certain Allen Ginsberg, who at the time was an impressionable 19-year-old trying to make his way in New York. Also on the scene are a young Jack Kerouac and William S Burroughs. Carr served 18 months in jail for manslaughter and right up to his death in 2005, he claimed that the murder was done in self-defence against an older homosexual stalker. Directed by first-timer John Krokidas, this little-known episode in the lives of the Beat Generation took place before they became literary stars. Hall says, "I was familiar with the Beats and this particular story. I was always amazed that it hadn't been told and I was really excited when I read the script that it was finally being told, and that it was as carefully rendered as it was." Several cinematic tales have centred on the Beat generation in recent years; there was Howl starring James Franco, and the lamentable On the Road directed by Walter Salles. Kill Your Darlings benefits from being set in an epoch when little is known about the writers. It also has a stellar cast of upcoming actors, with Daniel Radcliffe playing Ginsberg, Dane DeHaan as Carr, Ben Foster as Burroughs and Jack Huston in a brief appearance as Kerouac. "I think there was a collective freedom in that we were meeting all these characters before they became icons," says the North Carolina-born star. "In my case I was playing a character about whom very little was known aside from sketches about his relationship with Carr and the fact that he was murdered." There's one thing he looks for in all his roles: "I think if it doesn't feel like there's some degree of risk or danger or uncertainty then it's probably not worth doing." Hall has twice married and divorced actresses he has worked with. In 2003, he married stage actress Amy Spanger, and a year later he played Billy Flynn opposite her Roxie Hart in Chicago on Broadway. They divorced in 2007. Dexter fans got very excited when it was announced that he had married Jennifer Carpenter, who plays his adoptive sister on the show, on New Year's Eve in 2008. However, the relationship was short-lived and heavily shadowed by Hall's battle with cancer. He was diagnosed with Hodgkin's lymphoma. 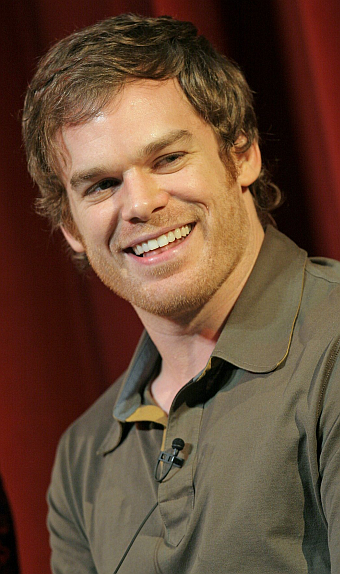 When he accepted the Golden Globe award for Dexter he was wearing a beanie to cover his post-chemotherapy hair loss. The diagnosis, which Hall received aged 38, was particularly hard as his father, an employee at IBM, had died of cancer when he was 39. He also had a sister who died in infancy before he was born. His mother, a college-guidance counsellor, was among the mightily relieved when it was announced in April 2010 that his cancer was in remission. During this period, and while he was contracted on Dexter, he couldn't take on other roles; "Doing the show created some opportunities that because of the show I couldn't take advantage of, because of obligations to continue to do the show." He directed an episode of Dexter, an experience he describes as, "Great! I enjoyed it a lot more than I feared I wouldn't. I felt worried that I would feel stretched in two directions and not be able to give full focus to either, but one sort of informed the other and I really enjoyed it. It was really difficult for me to say 'Cut! ', without some sort of absurd gesture or face; it felt sort of ridiculous. I couldn't say it with a straight face." The hardest part came during the edit: "It was tough because it is a subjectively told show and sometimes you do need to be tight on Dexter and that was a challenge at times." He has recently been shooting Cold in July, an adaptation of the cult novel by Joe R Lansdale. Hall plays the protagonist Richard Dane, who shoots and kills an intruder who breaks into his home in the middle of the night. As for whether it's better to play a character over the months of a movie than the years of a TV show, he states: "I don't know if it's better. It's different, or it becomes different after you do it over a certain period. You're not asking yourself the same questions. If you've been doing a television show for three years, like when we were doing Six Feet Under and we were in the fourth season, I had what felt like real memories, that were actually the memory of having filmed a scene two years before with these people, and that's a unique and heavy thing to experience."